What were you doing 5 years ago? Can you remember? Well, on this date 5 years ago I was 16 and in the midst of starting my first ever blog.. A Little Bit of Everything which not long later was renamed Reading A Little Bit of Everything. 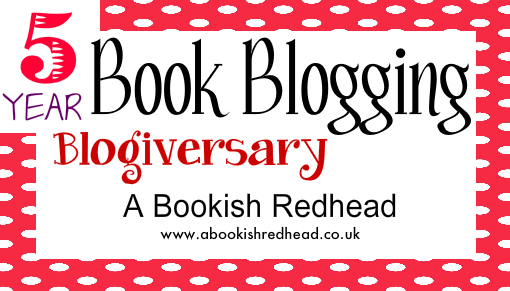 Now 5 years on it's called A Bookish Redhead which is rather perfect! I took time out last year and really contemplated my bookish life and blog, was it something I wanted to continue. Did I have enough time? Is my passion still there? I'm happy to say that with a clear mind I am not discontinuing my book blog but looking at today as a new start! I'm closing the chapter and starting to write a brand new fresh one. I believed it was about time for a new look! I've updated all my pages, made a page with my favourites from the 5 years, started a contact AND policy page plus made an archive tab with a full list of reviews, author interviews and guest posts. I've made sure it is less overwhelming, more organised for people to find what they are looking for and also easier to navigate. Instead of posting numerous posts and organising an event which is something I've always done I wanted to think of a way that I could say thank you which is why I will be sharing numerous posts from the past 5 years on Twitter and Facebook today along with little giveaways so be sure to check them out following the links to the side. I am also posting a giveaway below with more mystery books like the previous giveaway I done as it turned out to be successful! I have yet to wrap them but there will be 5! (as that seems to be my number theme) Check out the rafflecopter below and be sure to enter. I am getting excited for Bookish things coming up and have decided to go back to basics with A Bookish Redhead. I have read through ALL my blog posts to see which posts were liked and which ones weren't and hope that readers will stick around and check out the future posts. 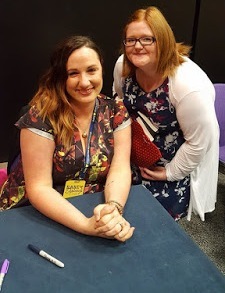 I'm going to Edinburgh for a Book Signing which Jennifer L Armentrout is attending! (I so hope she doesn't cancel! There is a book signing happening called Chapter Con which my sister is speaking at so it's a must I attend with her! There's a book event FINALLY on my home turf of Belfast! Woop in 2018 which I am super excited for. Congratulations on this great milestone! I wish you many more exciting years of book blogging! Going to a Jennifer armentrout signing event? !O_O really?!! that's wonderful i do hope you get to go and she doesn't ca,cel i want to know everything about this event so if you could make a sort of reportage it would be fabulous for those of us who dont have teh opportunity to attend! Congratulations on your 5 years of blogging!